Among the interplay of Saturn's shadow and rings, Mimas, which appears in the lower-right corner of the image, orbits Saturn as a set of the ever-intriguing spokes appear in the B ring (just to the right of center). Image released March 3, 2014. 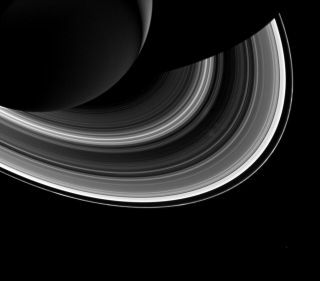 A new image captured by a NASA spacecraft shows Saturn's famous rings in gorgeous detail, with one of the planet's many moons shining in the distance. The space agency's Cassini probe snapped the photo on Oct. 22, 2013, when it was about 1.6 million miles (2.6 million kilometers) from Saturn and 38 degrees below the ring plane, NASA officials said. The planet's battered "Death Star" moon Mimas is visible as a pinprick of light at the bottom right. "The exact mechanism of spoke formation is still the subject of debate, but ring scientists do know that spokes no longer appear when the sun is higher in Saturn's sky," NASA officials write in a description of the image, which was released Monday (March 3). "It is believed that this has to do with the ability of micron-sized ring grains to maintain an electrical charge and levitate above the rings, forming spokes." The $3.2 billion Cassini mission, which launched in 1997 and arrived at Saturn in 2004, is a collaboration involving NASA, the European Space Agency and the Italian Space Agency. Cassini is slated to continue orbiting Saturn until 2017, when its mission will end with a designed death dive into the huge planet's atmosphere. The Cassini spacecraft also ferried a probe called Huygens, which landed on Saturn's largest moon, Titan, in January 2005. Huygens managed to send data home to Earth for about 90 minutes after touching down on the moon, which sports seas of liquid hydrocarbons on its frigid surface.